If you know me in real life, a phrase you'll hear me say way too often is "I've got this app..." and I'll then proceed to tell you how it's changed my life along with a guided tour of all the features. I often make my friends cringe when they see the pages and pages of apps on my phone, but to tell you the truth, I can't help myself. I thought it might be pretty nice to stop blabbing to my friends all the time about various apps, and instead, share my absolute favourites with you guys. Chances are if I find them handy, you will too! To get the ball rolling, I want to start with an app called Habitica. I stumbled across this app when it was 'app of the day' in Apple's app store and to be honest, I wasn't sure if I'd like it or not, but I really liked the concept. 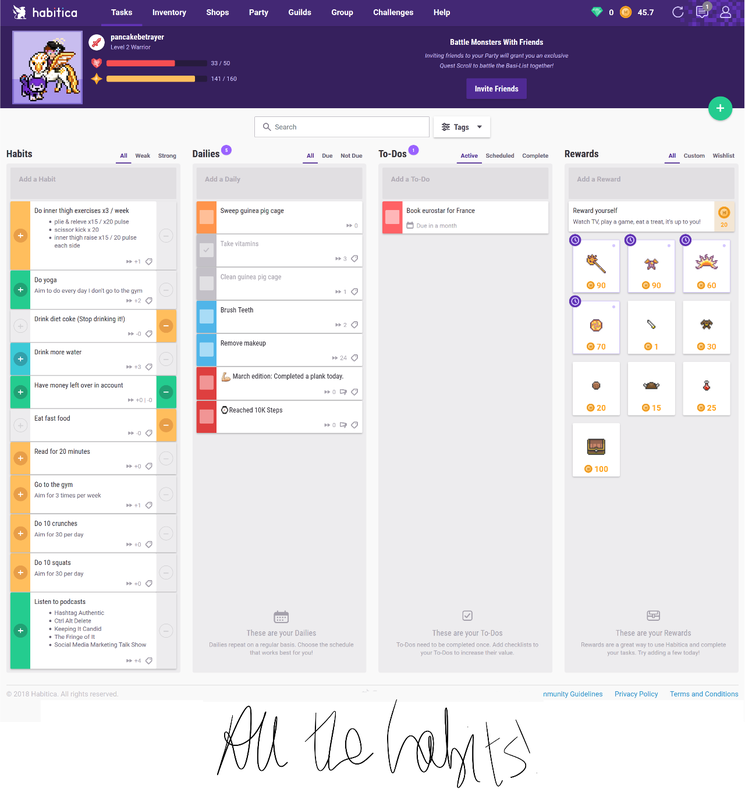 Habitica is an app which allows you to track your habits, daily to-do list, and one-off tasks. What makes this a bit different from your average to-do list type app, is that you have a character to represent yourself, and the more you tick off, the more experience you gain, and you level up. Likewise, if you note down your bad habits you'll notice your health bar taking a hit! This is what's kept me interested in the app. I'm a gamer at heart (give me a tycoon game and I'm oh so very happy) and so the idea of gamifying my life seemed pretty cool. And might get me to stop drinking diet coke all the time. Listen to podcastsThese are habits that I either want to improve on, such as going to the gym or cut back on, like eating fast food and drinking diet coke. 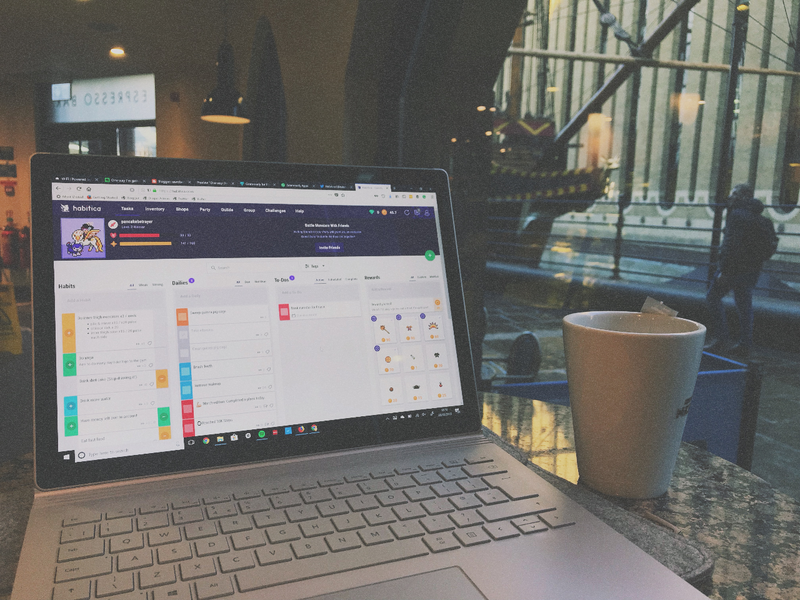 Habitica allows you to determine if a habit has positive or negative outcomes (or both) so that when you do them you press the plus or minus button. Yellow is neutral, green is good, and red is bad. 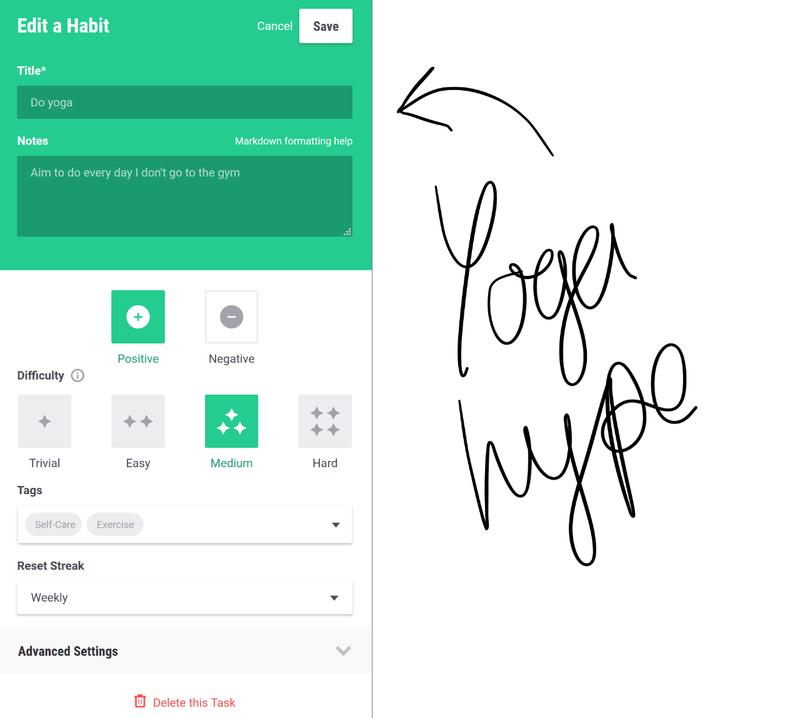 I like setting habits like this as, like you can see in some of my notes, I set an aim for so many per week but I'm still flexible as to when. You can change the frequency to refresh at different times, such as daily, weekly or monthly. Tasks in this section are things which I need to do that day. Greyed out tasks are things that you don't need to do that day, but are kept in sight so you don't forget them. As you can see, some of these I'm doing really well with - blue is even better than green, and some I'm not doing so well with. You can join in with challenges on the platform and this is something I've only dabbled in, to be honest. I tried joining one where I have to plank every day (I did 0 planks haha) and one where I am aiming to walk 10k steps a day. Often I come in just under this so don't get to tick it off - cry. I'm going on a trip later in the year and nearer the time need to book a train ticket. I can't actually book this far in advance yet, hence why it's red, but I'm definitely not going to forget. I generally put less in this section just because I'm a bit of a scatterbrain and seem to be less inclined to do something if I write "Write this post by tomorrow". I have to be in the mood. Plus I'm still using my bullet journal for a lot of things like that. To sum it up, I've been using this app for nearly all of March and haven't got bored of it yet. I'm fluctuating between a measly level 1 and a slightly less bad level 3. If you keep letting your health bar go down you will lose levels! Something to note is that when you miss Dailies & To-Dos deadlines, the following day you'll see your health bar take a hit. Oh, oh, aaaaaand, it will also go down every time you log one of your bad habits! This has really helped me stop drinking as many fizzy drinks. 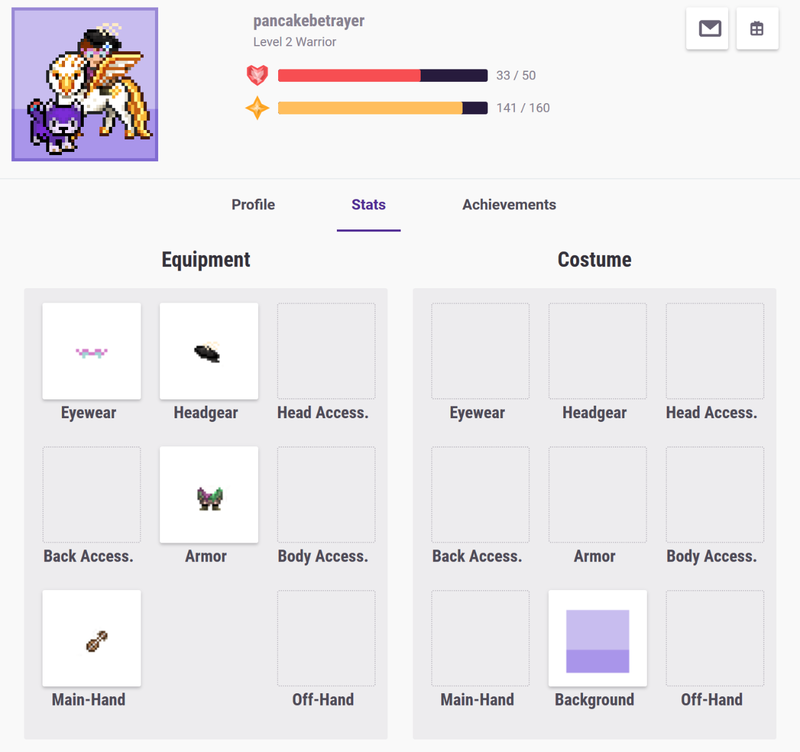 There is a lot more to play within this app, you can collect items to decorate your character, you collect eggs, hatch them into pets, can join guilds, take part in challenges! There's a lot to explore. I'm slowly decorating my character but am just enjoying the visualisation of my habits at the moment. What do you think? Perhaps something you might try?